Welcome to Chitwan, home of the one horned rhinoceros, wild elephant, tiger, sloth bear and a host of other wild animals. 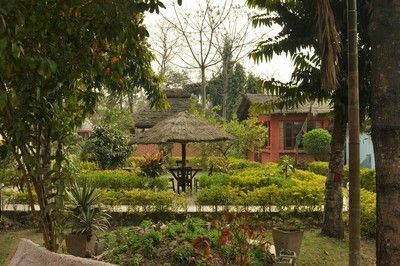 We have got ten rooms with private bathroom and a dormitory built in traditional bungalows around a lovely garden setting full of flowers and trees between which you can rest on a hammock. 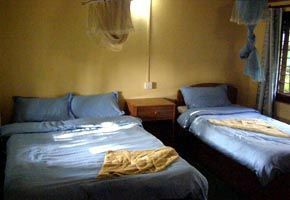 All our rooms are equipped with mosquito nets and fan. 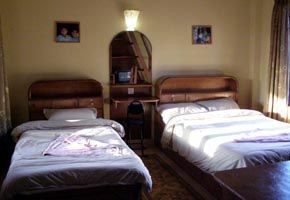 A/C rooms available. WIFI available for FREE.We offer a free pickup from the bus park. Just let us know what time and from where you left so we will be there. By busThere are few daily tourist buses from Kathmandu to Sauraha. It takes around six hours to complete the 180 km journey because the roads are in bad condition. You can get a ticket in any hotel or travel agency. There is also a tourist bus from Pokhara and one from Sunauli at the Indian border. They both take around five hours to get to Sauraha bus station where one of our staff is always waiting to pick up our guests.By airThere are few daily flights from kathmandu to Bharatpur (25km away from our resort). We can organise a transport from the airport to our resort. There is no flight to other destination.By bus / rafting / busYou can also include a few hours rafting in your journey to Chitwan. The same tourist buses will drop you at the starting point on the 'Trishuli' river if you come from Kathmandu and on the 'Seti' river from Pokhara. The rafting companies will organise transportation to bring you to Sauraha from the ending point. We can also arrange everything for you.By bus / trekkingIt is also possible to come to Chitwan by trekking in the 'Chepang hills'. It takes three to five days to complete this trail. This trek is very interesting because of the home stays. You can discover an authentic and unspoiled life style. Click on the 'Siraichuli trek' button on the homepage for more details.